Custom activity types allow you to be more specific when recording your experiences in Time2Track. Each of your custom activity types must be connected to a standard activity type in your current list. Select Custom Activity Types under Activities. Click Add a Custom Activity Type. Enter the name of your custom activity type and select one of the standard activity types, then click Save. Custom activity types that you create will show up in dropdown lists after the standard activity type it's connected to. 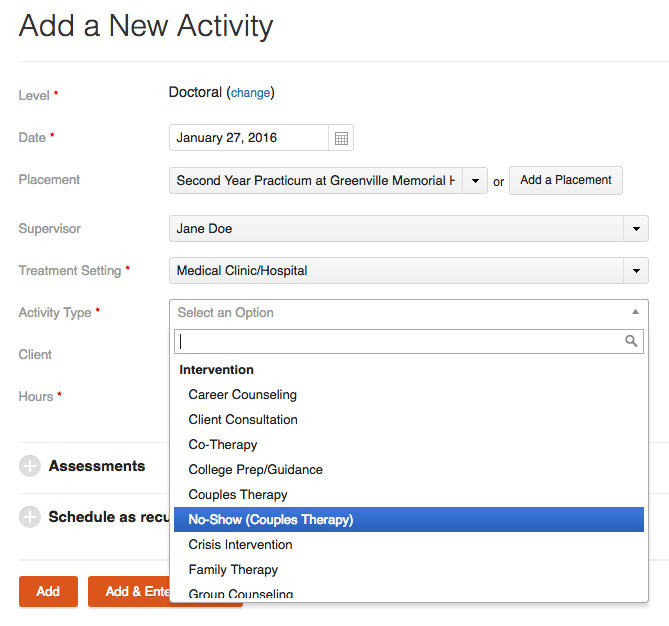 In the example above, our custom activity type No-Show would display under the standard activity type Couples Therapy. Custom activity types are included in Time2Track reports. The Activity Summary and Combined Summary reports have an option to consolidate custom activity types. When checked, this option will include your custom activity type totals in the standard activity types they are associated with, instead of listing each custom activity type separately. When unchecked, your totals for each custom activity type will be shown and will not be included in the standard activity types. On the AAPI View report, custom activity type totals will be included in the standard activity types they are connected to. Custom treatment settings can be used to track specific training sites and even supervisors. This is especially useful if your program is not using Online Approval. Each of your custom treatment settings must be connected with a standard treatment setting in your current list. Select Treatment Settings under Activities. Click Add a Treatment Setting. Enter the name of your custom treatment setting and select one of the standard setting types, then click Save. Your custom treatment setting will show up in the Treatment Setting dropdown menu when you add an activity. If your program is not using Online Approval, you can track training sites and supervisors using custom treatment settings. Just add a separate treatment setting for each training site / supervisor combo. Use the naming convention in the example above (Training Site Name - Supervisor Name), or make up your own. On the AAPI View report, custom treatment setting totals will be included in the standard treatment settings they are connected to. You can edit a custom activity type by navigating to Custom Activity Types under Activities, clicking the activity type name, making your changes, then clicking Save. Editing custom activity types will change ALL associated activities to the new name. You can delete a custom activity type by moving your cursor over its name, clicking the X button that appears, then clicking Delete this custom activity type. Deleting a custom activity type will remove the custom name from ALL associated activities and the associated standard activity type will be used instead. You can edit a custom treatment setting by navigating to Treatment Settings under Activities, clicking the treatment setting name, making your changes, then clicking Save. Editing custom activity treatment settings will change ALL associated activities to the new name. You can delete a custom treatment setting by moving your cursor over its name, clicking the X button that appears, then clicking Delete this setting. Deleting a custom treatment setting will remove the custom name from ALL associated activities and the associated standard treatment setting will be used instead.